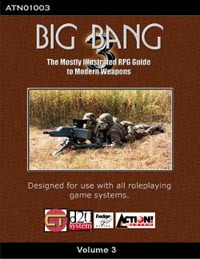 This particular volume of Big Bang focuses on the Army Future Combat Systems. We’ll look at the entire family of new weapons being developed as variants of the XM8 Lightweight Assault Rifle and revisit the XM29 SABR. We will also cover the X312 .50 Caliber Lightweight Heavy Machine Gun, the XM307 25mm Crew-Served Weapon, the XM25 25mm Airburst Weapon, the XM107 Long Range Sniper Rifle as well as its M82 "Light Fifty" predecessors, and Barret’s XM109 Payload Rifle. We also cover the Predator SRAW, AT8 Bunker Buster, Multi-Purpose Individual Munition/Short Range Assault Weapon, and the XM320 40mm Grenade Launcher. It all comes with the usual stellar combination of tasty fluff and crunchy goodness you’ve come to expect from the Big Bang series. Over 30 weapon systems and variants are covered in this volume.